Yesterday, was my birthday. I fasted the whole day asking for Lord Skanda to bless me on this day. I went to the temple that day and waited for some signs, in the form of flowers falling from the vikgram, but nothing happened. Not losing faith, I kept thinking of Murugan's feet and dedicated all that I did during the day to Him. For example, whenever I ate, I said,"Aum Skanda-Parnam Astu (Let this be an offering to Lord Skanda)." Whenever I finished doing service to a person, they would say,"Thank you." I would reply,"In Skanda's Service." Hence, my day came to an end. One day after having that wonderful dream, Lord Skanda bestowed me with another "belated" birthday gift! I was working with the Canadian National Institute for the Blind (CNIB) as an assistant camp coordinator to organize and run a camp program for visually disadvantaged youths. Today, we went to the zoo. At the zoo, a guide received us and showed us around the area. It was a wonderful experience, seeing and learning about the animals at the zoo. I also was fortunate to see a free roaming peacock and upon doing so I immediately closed my eyes, thought of Skanda, and said His sacred mantra thrice. The peacock looked at me and then ran away. I tried to keep up with it but it was just too fast for me. As the day came to a close, the children and I began to exit the zoo, when our guide came up to me and spoke the following words, which I remember ever so vividly,"I am supposed to give this to you." As she said these words she presented me with a peacock feather! Relating this experience with the dream I had a day ago, with the peacocks, I realized that it was Skanda's birthday gift to me. I've always loved peacocks and especially their beautiful feathers. 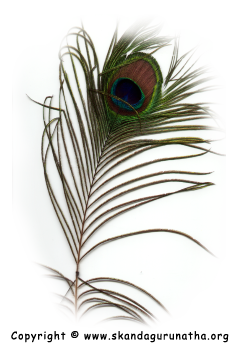 Here is the picture of the peacock feather birthday present that Skanda graciously presented to me through the lady at the zoo. It now rests in my altar room on top of Sri Skanda's picture. To this day, I believe it was the best birthday present ever. "This eye in the peacock feather is symbolic of God’s eye. Look intently at it and become one-pointed; then again close your eyes and contemplate its deeper meaning." The peacock has many feathers and thus, many "eyes." Hence, if it is symbolic of God's eye, that means God's presence is everywhere. No matter what we are doing, we cannot hide or ignore God's all-pervading divine presence. Sri Skanda is implicitly stating that He is omnipresent. And this divine leela of His, reinforces His case and point!